“What is that intoxicating scent?” I look around but I’m not seeing a flower at nose level as I walk the back road this early June day. I close my eyes and slowly move my head around, taking in the all the scents I can. Ah, up. 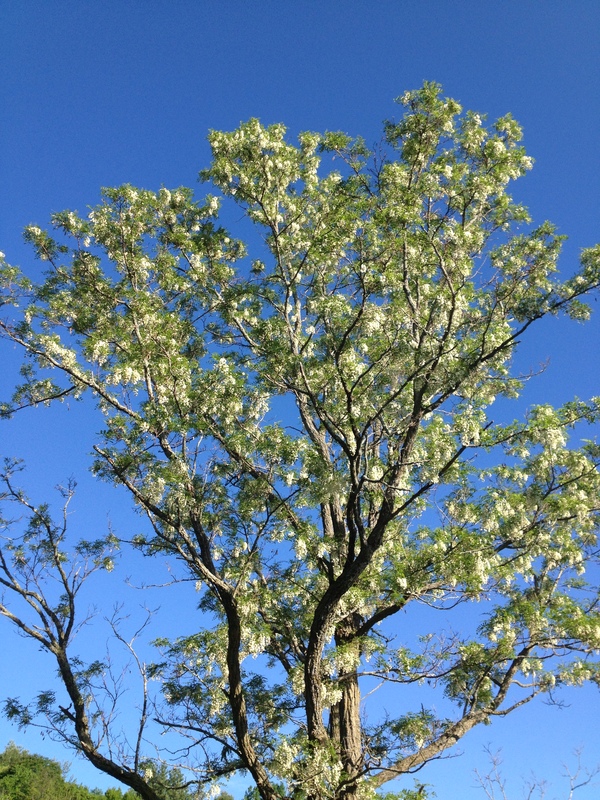 I open my eyes and observe that I am under a Black Locust tree, with tumbles of white flowers cascading down in racemes. Now how to reach them? I am not a very strong jumper, but I give it my all to reach the lowest branch. No go. I would need more than a pogo stick to help me on this one. I look around for a long downed branch that I can use as a hook. This takes some time but within 10 minutes I am back at the base of the tree and reaching up with my makeshift tool. A crow flies overhead cawing. I shout with glee, “Look and be proud.” The crow merely affords me a glance. I want my crow neighbor to be proud of my ingenuity with a stick as crows too use sticks as tools, though obviously much smaller. And usually crows are using twigs to reach in to some place to get at a member of the animal kingdom, not up to some place to get at a piece of the plant kingdom. After several attempts my tool is still not working properly – meaning, it is not pulling the branch down to where I can reach the flowers. It’s just sliding off and raining a few broken blossoms on me. Hmmm. I reach and tug once more. The stick breaks. I need a better hook. Now why am I going through all this trouble to get some flowers? Because Black Locust flowers taste wonderful! Reminiscent of a sweet grape with the crunchiness of iceberg lettuce, they are a wild edible delicacy. But they are not around for long. They begin blooming in late May and early June, here in Western Massachusetts, and they are gone within two weeks of blooming. They are most tasty when still bright white. Once the flowers start to fade, the taste does too. Robinia pseudoacacia, is a member of Fabaceae, the pea family. 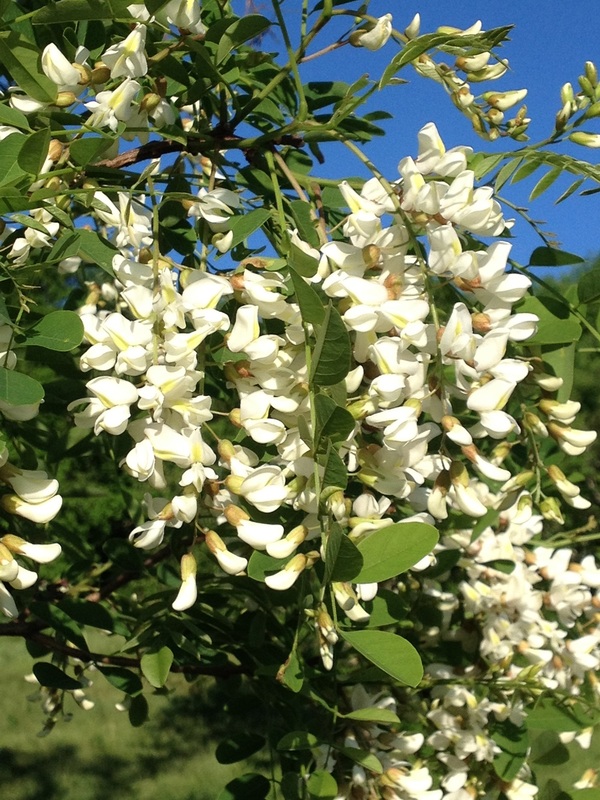 Black Locust flowers are white and look like pea flowers on drooping bunches. Though native to the southeastern United States, Black Locust has expanded its range, having been widely planted throughout the northeast. 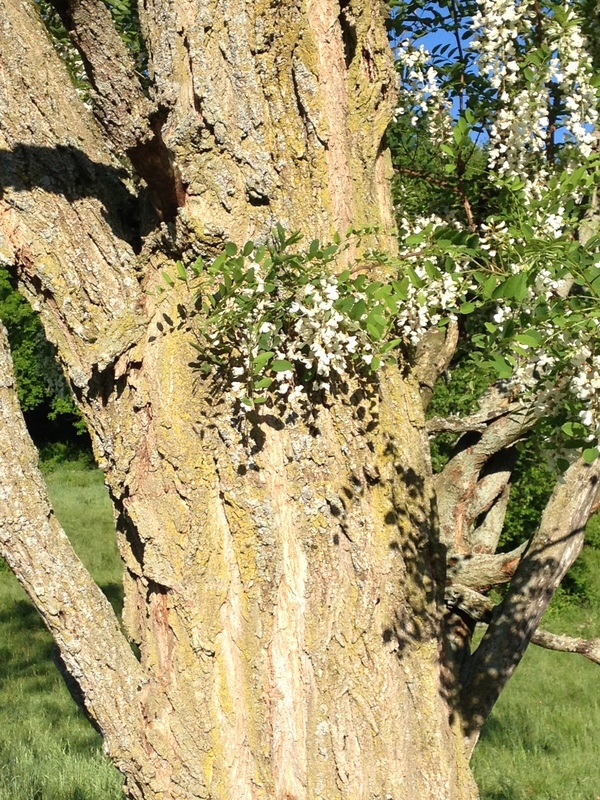 Like the beloved Apple, the Black Locust has been naturalized, fitting in quite well to the landscape. Some would say too well, and consider it invasive. Black Locust is appreciated for its rot resistance and it is considered by many to be the most durable American wood for ground contact, making it excellent for fence posts. This resistance to rot also makes it a strong choice for firewood. It is considered a pest by some because of its ability stump sprout, mind you, it used to be valued for this trait. Cut the tree down and in a number of years you have more trees to again cut to make more posts. But we are no longer a nation of fence builders to keep our multitudes of herds in place. We just don’t need that many posts apparently, so the Black Locust continues to grow and grow on the edges, between our forests and our fields and roadways. Meanwhile, I want to add some flowers to my pancake breakfast and to my salad for lunch. When I finally return home with several racemes, I am almost not hungry for breakfast because I have been munching on the flowers along the way. To make locust blossom pancakes, prepare pancakes as you normally would. Mine are gluten free. To the batter I add a handful of Black Locust flowers. Pan fry the pancakes in a small amount of oil – I love using coconut oil. 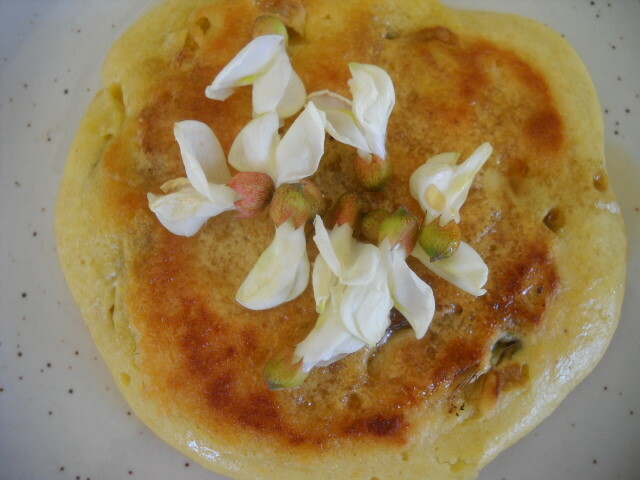 Sprinkle your pancakes with more flowers and give a healthy dollop of freshly made Rhubarb sauce on top. I cook my cut Rhubarb stems with a bit of local honey. And “Voila!” you have begun rewilding yourself by adding a wild edible to your meal. A word of warning: though the flowers are edible raw or cooked, no other part of the tree is. Do NOT eat its legumes or seeds raw as they contain phytohemagglutinin, a protein which causes red blood cells to clump together – not anything you want to experience. Tender green immature legumes can be boiled and then eaten and seeds can be eaten after soaking overnight and then boiling for about an hour. Also beware; the bark, leaves, and roots are toxic and cause nausea, but can serve as a medicinal if prepared properly. If you really want to try the legumes or seeds, please consult additional resources on this wild edible. If you miss the season and find only faded yellow flowers littering the ground, you can keep an eye out for the tree for next year by looking for dark gray-brown bark that is deeply furrowed on older trees or a smooth taupe bark on saplings. On the saplings you will notice thorns on the trunk and branches. The branching is alternate. Delicate green leaves are pinnate compound with approximately 13 oval leaflets unfurling in later spring. In autumn, leaflets turn a pale yellow. Hopefully by reading this, you will be inspired to head out now, equipping yourself with a crooked stick and a wild edible guide book or two, to discover a flowering Black Locust. They are all over the back roads in the Hilltowns. Sniff. Swoon. Eat. Enjoy! Arianna Alexsandra Collins, naturalist, poet, and wild edible enthusiast lives in Ashfield, MA. You can reach her at OfferingsForCommunityBuilding.com or HearkenToAvalon.com. This entry was posted in Natural History, Natural Science and tagged Arianna Alexsandra Collins, Black Locust, eating black locust flowers, Into the Outside, Wild edibles. Bookmark the permalink. A lovely post which I just discovered on the WP Reader as an additional suggestion under my own post on locust blossoms: https://beautyalongtheroad.wordpress.com/2017/05/20/our-wild-food-heritage/ I would love to link to your informative post, if you are agreeable. Great, thank you for that, Arianna.